YEU needs Shop Stewards…workers like you who are willing to take some training and be available to help colleagues who need an ear, someone to accompany them to a meeting or to help find a solution to a problem at work. Who can be a Steward? Any member in good standing of Yukon Employees’ Union can be a Shop Steward in their Local. What about training? YEU has created a new staff position dedicated to strengthening our Shop Steward team. New training initiatives will be announced over the next year; it’s a very good time to step forward as a Steward! YEU currently offers monthly Shop Steward Round Table sessions held the 3rd Wednesday morning of each month. These informal presentations offer opportunities to ask questions and learn from others. 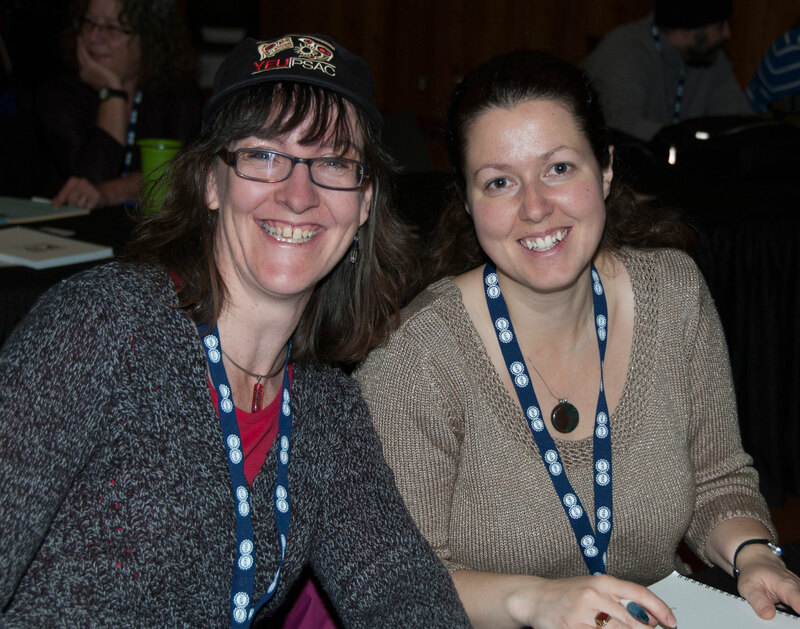 The PSAC office in Whitehorse also offers regular training on things like union structure, roles, Local Officers training and more. There is online training available through PSAC’s Education program and workshops are offered by affiliate organizations throughout the year. Yukon Government has an employer/union co-facilitated course on the Grievance Process – required training for all YG Stewards which can be accessed by all YG members through the Quarterly. No union leave is required for this training. For other training approved during your regular work hours, YEU reimburses your employer for your time; you will not lose pay to attend. What will I be expected to do? Your co-workers will likely ask you questions about the contract, the union or their own work situations. Stewards are called by our Intake Officer at YEU to accompany members to fact finding meetings with their manager or supervisor. Your role at these meetings is usually as an observer, note taker and provider of moral support. In some cases and with appropriate training, you may be asked to participate more fully in discussions at meetings, but not until you have received coaching and feel prepared to do so. Is it all volunteer work? Most contracts have a clause that permits Shop Stewards to do union work while on the job. You submit a leave form citing the appropriate article from your collective agreement for the time you spend researching or representing a member. Your pay will not be disrupted. Representation work done outside your normal work hours is done on a voluntary basis and is not compensated. My workplace already has a Steward. Stewards represent workers from their Local, not just from their specific workplace so don’t let that stop you. The more well-trained Stewards we have the better. If I make a mistake, will someone lose their job? No. You will have a network of support including our well trained & experienced Union Advisors. As a Shop Steward you will have regular conversations with our staff in order to ensure everyone is working in unison for members. How do I become a Shop Steward? Each Local’s bylaws are worded differently. Some dictate that Stewards are elected at the Local’s AGM, others allow for nominations and elections at any time. Your Chief Shop Steward or your Local President will guide you through the process. Once we’re advised by your Local that you’re a Shop Steward, you’ll be invited to our office to be sworn in by our President or Vice-President. You’ll get an orientation to our office, staff and procedures and receive your New Steward’s package. Once you’ve met everyone, you’ll be registered for upcoming training. Will becoming a Steward make me a target for my employer? Shop Stewards who are well trained and level-headed help create workplaces that function smoothly. Employers recognize the benefit of a union liaison in the workplace and are usually very happy to work with them. It’s in everyone’s best interest to solve problems quickly and cleanly. It is very rare that our Stewards find themselves in conflict with their employer simply by virtue of stepping forward as a representative. Will co-workers expect me to be an instant expert on our contract, labour law and all things union? Your role is to ensure members have fair representation and that all pertinent information is recorded, provided to the Union Advisor and kept confidential. You’ll need to get to know your contract but we do not expect you to interpret the agreement or be up to date on all labour issues. A Steward needs to be compassionate and organized. The Steward’s role is one of problem solver and witness. At some point in their careers about 50% of workers call their union. It might be a simple question about vacation leave, a scheduling issue or ongoing and persistent harassment from a co-worker or supervisor. To meet our members’ needs when they need support we need your help. Please call your Chief Shop Steward, Local President or the YEU Office today. Visit yeu.ca for contact info.